Trend lines are interesting. Are they related to performance upgrade package timing (maybe of leading car...) or are they due to track characteristics? I guess the next step would be to decide how we can differentiate between possible explanations. As a first pass attempt at this, using the data available here, I wonder if we can use sector times to try to distinguish between track dependent improvements and car dependent improvements? Anyway, as a step towards that (does anyone have a categorisation of track sectors I could play with? 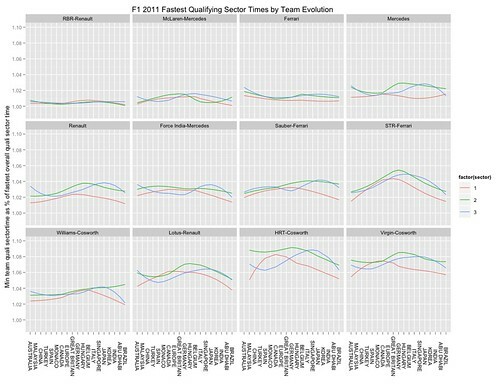 If so, add a link in the comments:-) here are a couple of charts relating to the evolution of normalised sector times by team across the season. I guess what both these charts show is that the relative performance changes from race to race across sectors do not necessarily correlate with each other. If we could categorise each sector for each track in a way that relates to dominant track features for the corresponding sector that might effect car performance, we might get a better idea of whether car updates or track features are influencing performance? 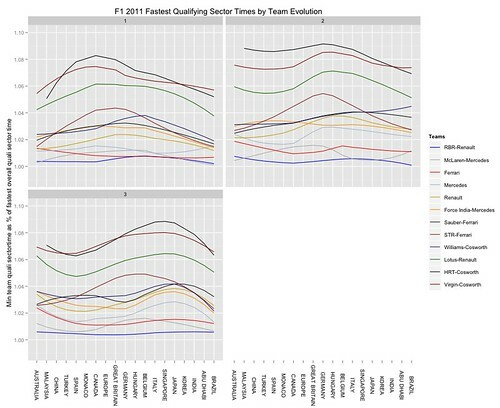 For the F1 sports journalist, might the charts hint towards any particular lines of investigation?